Collins Academic Skills series is a new set of books covering several aspects relevant to academic study. They are designed in particular for students from abroad who are studying, or intending to study, at an English-speaking university. The two volumes reviewed here are Writing, for learning to write better academic essays, and Numbers, designed for the non-specialist dealing with data and statistics. The books are designed for self-study and are divided into chapters which can be studied sequentially or individually. Each chapter begins with a self-evaluation quiz, whose questions give an idea as to what is contained within the chapter, and whether the student will find it useful. The chapter then continues with the input for the unit, which is interspersed with exercises for practise, and short ‘tips’ containing good advice relevant to using the chapter information in real life. The books include sections specific to learning English as a foreign language, but the focus of the books is broader than pure grammar or lexis, and they act as a primer to the general academic area they cover. One characteristic feature of the books is the glossary boxes in the book margin, containing definitions of potentially new or difficult words, in addition to the main glossary list at the back of the book. Having these explanations to hand, without having to cross-reference a dictionary or appendix, is a useful timesaving idea, and the definitions are generally relevant and clear. Numbers is aimed towards prospective and current students of humanities and social sciences, who may not have worked with numbers and statistics, but whose intended research will require them to do so. The scope of Numbers is very broad indeed. It begins with some basics about using, and talking about, numbers before covering formulating research questions and research methods. It also deals with percentages and fractions and averages, before moving on to presenting data and describing observations and conclusions. The breadth of topics, within the relatively short book, means that each topic is dealt with very briefly, which makes me wonder who would benefit from the book. For instance, the book briefly explains place value, with an illustrative table of numbers and the value of certain digits within them; however, students who know basic arithmetic will understand this concept instinctively already, and may even be confused by the table, and those wishing for more technical details will also be disappointed. The sections on scientific methods and collecting data also seem to start from an assumption of very little knowledge, but are not sufficiently detailed to bring students up to speed: students would learn more detailed and useful information from a book written especially for a course on research or statistics, rather than for non-native speakers. Perhaps the low level of depth will be suitable for students in a university foundation year, but I expect even these students will already have covered the topics at school.. The definitions given in the margin are sometimes so general as to be of little use – for example, the ‘mass’ of an object is described as “the amount of physical matter that it has”: this is unlikely to enlighten somebody who does not know what mass is, and unlikely to be useful for a non-native English speaker who understands the concept, but does not know what it is called in English. Additionally, the definitions are not always chosen with due consideration of the context of the word within the main text, and hence the definition of ‘bias’ in Numbers focuses on personal bias where people “prefer one group of people to another, and behave unfairly as a result” whereas the text refers to sample bias. The most useful sections of the book are the language-related sections, as these are something that a book not specifically designed for language learners will not contain. The sections are clearly set out, and language is specific to the context of the chapter (e.g. reporting verbs for making conclusions), and practised using numerous exercises. 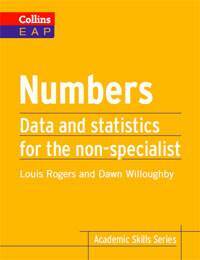 In summary, Numbers does have some useful language work but, as a whole, has attempted to cover such a wide range of topics that it is likely that neither anyone already knowledgeable in their sphere, nor anyone new to research, will find the book particularly edifying. The scope of Writing is much more clearly limited, and covers the key areas of academic writing, including focus on the reader, essay structure, register and style, accuracy, reading comprehension (when doing literature research), authority and integrity. The focus is very much on extended essay writing, with other genres dealt with briefly in the last chapter. Whilst all students, whether learners of English or proficient speakers, might need to develop their academic writing, this book does treat areas specific to learners in several sections: the most obvious is the chapter concerning accuracy, which addresses several common pitfalls when writing (e.g. subject-verb agreement), and each is tested with a handful of exercises. Other chapters address other language-related issues, such as using ‘cautious’ language, within the chapter about ‘authority’. A very useful feature is the appendix, containing annotated sample essays. These provide greater insight than non-illustrated explanations would do, and let the student learn by example how they can improve their own writing skills. Another appendix includes a list of useful language that students will be able to plunder when writing their own essays. In short, this book provided an excellent overview of academic writing for students intending to study in English-speaking universities. It covered an impressive amount of ground, and in significant depth. Despite belonging to the same series, my impression of the books was markedly different. I could not see who would find Numbers useful, as, despite some useful language work, it covers too many topics and in not great enough depth. Writing, conversely, had a much clearer aim, and would be very useful for any learner of English who wants to follow a self-study book to improve their academic writing.